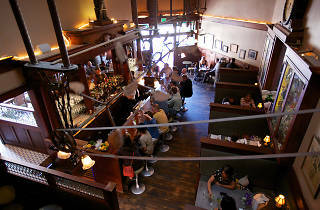 A homage to 19th century San Francisco with elevated classic cocktails and comfort food. 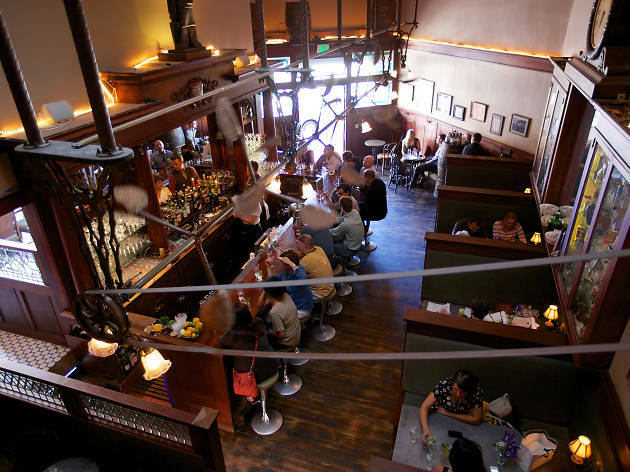 With its original mahogany bar intact, this saloon dates from 1907, but Comstock, which debuted in the space in 2010, is no fusty relic of a bygone age. Under bar manager Johnny Raglin, who was at the vanguard of the SF craft cocktail movement, the place brings fresh twists to classic cocktails, such as the Sazerac, Manhattan, Blood and Sand and Pisco Punch. Or put your fate in the bartender's hands by ordering a “Barkeep's Whimsy.” A full menu of hearty pub food includes dishes like roast chicken, oysters and cheese plates. Jazz bands often take to the small stage, complete with upright piano, overlooking the main bar. It's worth stopping by on Friday afternoons, since Comstock has resurrected the old saloon tradition of providing free lunch with the purchase of two cocktails.